Reading and share top 8 famous quotes and sayings about Triathlon by famous authors and people. 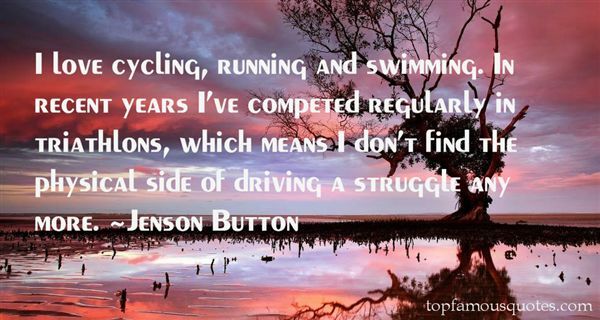 Browse top 8 famous quotes and sayings about Triathlon by most favorite authors. 1. "If I'm going to be working out two hours a day, I may as well have a goal... and I'm pretty competitive by nature. A triathlon is a new fun thing." 2. "Of course it was painful, and there were times when, emotionally, I just wanted to chuck it all. But pain seems to be a precondition for this kind of sport. If pain weren't involved, who in the world would ever go to the trouble of taking part in sports like the triathlon or the marathon, which demand such an investment of time and energy? It's precisely because of the pain, precisely because we want to overcome that pain, that we can get the feeling, through this process, of really being alive--or at least a partial sense of it. Your quality of experience is based not on standards such as time or ranking, but on finally awakening to an awareness of the fluidity within action itself." 3. "I love cycling, running and swimming. In recent years I've competed regularly in triathlons, which means I don't find the physical side of driving a struggle any more." 4. "Before I became a fighter pilot, everyone said that women didn't have the physical strength. Well, I had just completed the Hawaii Ironman Triathlon." 5. "I don't run the triathlons anymore like I used to. I do leg work on the machines and do the bike. I'm not as strong as I used to be, but I'm still good." 6. "I've been known to turn up drunk at triathlons and do very well. I'm more of a heat-of-the-moment type of guy. A friend will tell me about something coming up, maybe that weekend, and usually not an abundance of thought goes into my doing it." 7. "I was stunned. I pulled the phone away and looked quizzically at the hole-punched speaker. Aside from the blood obligation to be my sister's maid of honor, it had never occured to me that I would get asked to be in anyone's wedding. I thought we had reached an understanding, the institution of marriage and I. Weddings are the like the triathlon of female friendship: the Shower, the Bachelorette Party, and the Main Event. It's the Iron Woman and most people never make it through. They fall off their bikes or choke on ocean water. I figured if I valued my life, I'd stay away from weddings and they'd stay away from me." 8. 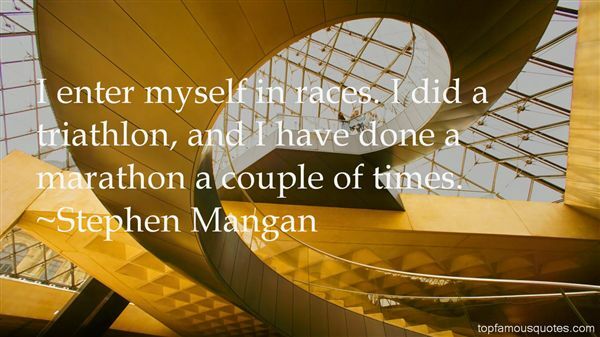 "I enter myself in races. I did a triathlon, and I have done a marathon a couple of times." These things will destroy the human race: politics without principle, progress without compassion, wealth without work, learning without silence, religion without fearlessness and worship without awareness."